Linda Fargo, Senior Vice President, Women’s Fashion Director and Store Presentation at Bergdorf Goodman. Photo by Mr. Newton. Getting back to pops of color, I am loving Linda Fargo, Senior Vice President at Bergdorf Goodman, in those yellow trousers she wore a few days ago during New York Fashion Week. I also love the studded and yet ladylike black bag, which is Valentino, and the multicolor fur scarf. Okay, I love the peacoat too, and the red lipstick. The whole outfit is perfect! I think I will have to bring a skirt or pair of pants with major color into my closet soon. I like this pencil skirt from J. Crew. No. 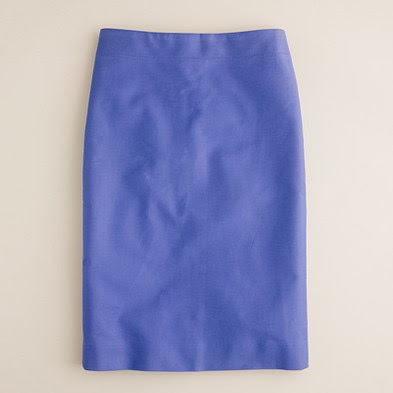 2 Pencil Skirt in Casablanca Blue. 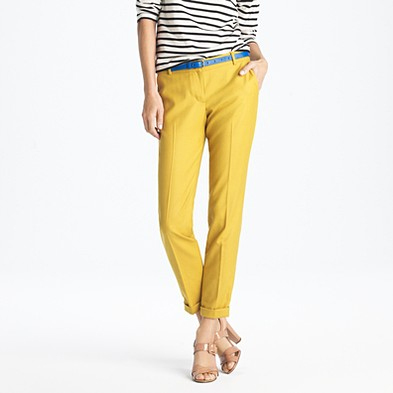 I also adore their yellow capris. Café Capri in Baked Citron. Of course my eye went right to the scarf...it is amazing! I love the whole, head to toe look and this would have me consider yellow pants when the the past I would not have considered them an option! She looks great! Good grief that scarf is incredible!! There is a little spread about her in this month's Harper's Bazaar. She is the definition of chic. I would choose the pencil skirt mostly because I look horrible in capri pants...my husband has banned me from wearing them (not really, but he does express his strong dislike of them whenever he sees them on me or anyone else). He doesn't ask much of me so I comply - and I think he may be right. They aren't generally flattering on pear shapes. She took my breath away, ahhhhhhhhhhhh So colourful and chic. Have a grand weekend, my dear Jill. Actually, I have been in search of a pencil skirt in the yellow/mustard color! You're right, she is fabulous.